He had his two assistants create a grid that was proportionate to how large he needed the children’s heads to be, to be the right proportions for the final composition. He then measured out how large the main adult figure was to be, using measurements from his own head and waist and that of another student, Mark, to get an approximation of some realistic male body frame measurements. He was essentially configuring how tall he wanted to make him in a balance of creative licence vs reality. He ended up making both children larger all around, elongating the adult figure, and widening the triangle composition of the three faces to create a more balanced and stronger painting. 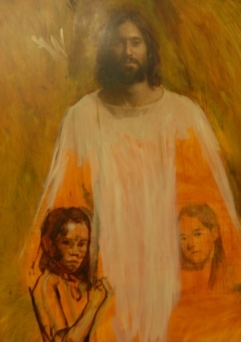 He ended the days work as he started to repaint and essentially “redraw” the two children’s faces over the old drawing and base painting he had previously had there. This entry was posted in Process and tagged art, art classes in Utah, drawing from life, Hein Academy of Art, jeff hein, oil painting, reference drawings, Salt Lake City, Utah Art. Bookmark the permalink.